Put the chopped tomatoes (4x 400g cans), dried oregano (2 tbsp), white wine vinegar (2 tbsp) and Worcestershire sauce (4 tbsp) into a large pan and bring to the boil. Reduce the heat and simmer for approximately 30 minutes until the liquid has reduced. Stir occasionally to ensure that the sauce doesn't burn. Season with salt and pepper. Meanwhile bring a separate large pan of salted water to the boil. While the water is boiling, make the meatballs. Put the beef mince (500g), pork mince (500g), breadcrumbs (50g), dried oregano (1 tbsp) and egg into a large bowl. Use your hands to thoroughly mix together the ingredients. Using your hands, form the meatball mix into balls about 3cm diameter. Add your pasta (8 servings/600g dried pasta) to the boiling water and cook according to the packet instructions. Meanwhile, heat the olive oil (1 tbsp) in a large frying pan on a medium heat. Add the meatballs and cook for approximately 10 minutes until they are cooked all the way through. 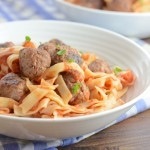 Turn/shake the meatballs regularly to ensure they cook evenly. Once the pasta, sauce and meatballs are all cooked. Add them all to the same pan and give it all a good stir to ensure everything is coated with the tomato sauce and serve.